Below is an interesting and entertaining video from Planet Money. They research the labor and material cost of an expensive designer wedding gown and concluded the dress the reporter bought was a rip off because the total of the two was less than half the price she paid. She thought she was getting a deal because the price was several hundred dollars less than full retail. On the surface, the argument is convincing. Dig deeper and not so much. The costs involved in transforming raw materials into a finished gown at your local bridal shop are many. Aside from the material and labor to sew it into a gown, there are also three levels of mark up. The maker needs to get enough for the gown to not only recoup their material and labor costs, but also pay for sales people who meet with their distributors, marketing, other support staff, and general overhead. And this is only the first mark up. The second mark up is when the distributor sells the gown to the your local shop. The distributor must recover what she paid for the garment plus operating expenses. And the cost of transporting the gown from place to place. And still make a profit. The third mark up is by your local wedding shop. She has to cover her cost (which includes the two changes of hands–and corresponding cost increase–before her) plus pay her personnel to give you personal service; rent, electric, Internet, and phone for the store; advertising and marketing costs; and other overhead. 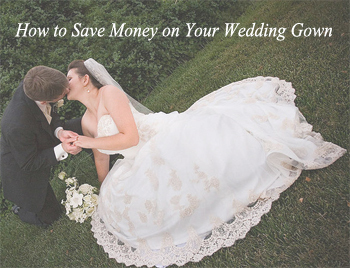 So what’s a bride on a tight budget to do? Your beauty does not depend on the amount of money you spend. The dress style matters much more. Understand what feature(s) will help you look your best, and look for inexpensive gowns with those features. Combine a sale with a coupon to get double savings (our partners’ deals are here). Also, consider more economical channels than your local retailer. Online wholesalers sell at nice prices. The surprisingly elaborate gowns on this page, for example, are priced from below $100 to around $300. Buy on eBay. The sellers of new gowns have bypassed some of the above costs. In the case of used gowns, brides are trying to recoup some of their original costs, which means a bargain for you (the auctions here are all under $300, with free shipping). Of course there are pros and cons related to each approach to purchasing a wedding gown. That said, there are many opportunities for finding the gown of your dreams on a “DIY budget”.